For us in Western countries, the Christmas story has long had a compelling resonance, whether we’re Christians or not. I know several atheists, Jews, and non-Christian Asians who celebrate some form of the Christmas holidays with a decorated tree and gift giving. They take children to Christmas pageants, and they voluntarily listen to music that proclaims the divinity of Jesus and celebrates his birth in a hovel in an ancient, impoverished land. What is the appeal of that simple tale? How and why has the image of Jesus in a stable endured as a central icon of world-wide Christian mythology for nearly two millennia? Indeed, the birth of Jesus was not a part of the gospel of Mark, which scholars agree was the first written gospel. Rather, Mark’s gospel begins with the baptism of Jesus by John the Baptist. However, Matthew’s gospel, although written later, was placed before Mark in the canon, presumably to offer a story of Jesus’ birth that could appeal to the common people of the Roman Empire. Ordinary subjects of the empire were, at that time, oppressed physically, often as slaves, and financially, through taxes, tithes and bribes to Roman officials as well as to local upper-class tyrants. Let’s look more deeply at what that image of a baby in a manger implies. 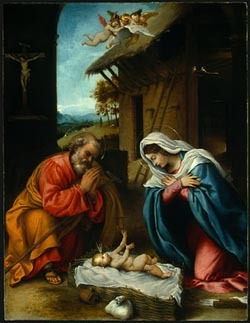 First of all, the image of a central religious figure as a helpless infant calls forth the impulse to love and protect. This story of holiness in the smallest, most innocent child, gives worshipers permission to love—rather than fear—that which is Holy. Moreover, the poverty, the homelessness, the helplessness of the baby and family imply that the Holy can spring from the most deprived conditions. Those who heard this story could identify with the protagonists, wandering homeless, impoverished by taxes, forced to make do with what little generosity might be forthcoming from strangers. Moreover, the fact that the mother was unwed added a stigma that placed her near the bottom of the social hierarchy. That God would bless such parents with a holy child might offer hope to others struggling in poverty and despair. Finally, the gathering of others around the newborn Jesus—in Matthew, Wise Men; in Luke, shepherds and angels—to bless this ordinary event gives it improbable significance, which offers comfort to those who must bear up under similar circumstances. This image of the beginning of the life of Jesus was an image of hope. The imagery at the end of his life was very different (more on that later). From your theory, you think I decorate for Christmas because you see the symbols I use as “belonging” to the Christians. You won’t find any baby Jesus or manger in my house. However you will find those symbols of returning Life and Light, the evergreens, candles, twinkly lights, stars, bright colors and shiny objects, which use is much older than Christian tradition. The celebration of the longest night of the year (quite long this far North!) and the dawn that ends the siege of the darkness. Eating, drinking, storytelling, games and gift giving in shared company are how humankind has celebrated the Cycle of Life from before written records existed. Every feast was based on shared bounty – the gift of food and drink to share with all, thus beginning the tradition of the host/hostess gift. So by following these traditions at the time of the Winter Solstice, Christians honor our ancient ancestors. And I am glad. Lynne, I quite agree with you that much of the symbology of Christmas comes from an era that predates Christianity in Europe. Early Christians freely borrowed from pagan rituals – decorating trees, calling light back into the world after the winter solstice. These popular practices were adopted by early missionaries in Europe and adapted to the Christmas story as a way to make Christianity more compatable with local practices. The timing of Christmas, December 25, was probably borrowed from the Mithraic mysteries (originally from Persia and India), popular in Roman culture at the time of Jesus, Mithra(s) being the son of the sun and reborn at this time of the year. Indeed, no symbol or tradition “belongs” to any religion; they have all borrowed from one another. In the above meditation, I was simply looking at reasons for the long-lasting appeal of the Christmas story. As far as I know, Mithra(s) was never depicted as a baby in his cult rituals, and his followers were mostly military, so his cult died out in the West after the fall of Rome.